NES Super Mario Bros. (PRG0) "warps" in 05:03.73 by Michael F.
The classic game that we grew up with completed much faster than most people think is possible. The length is 5:03.73 (18224 frames), from power on to touching the axe. It is 130 frames (2.17 seconds) faster than the previous version, which was already thought to be perfect. Even in simple-looking games you can always find more time-saving tricks to exploit if you look hard enough. See what we've found at the Super Mario Bros. Tricks page. This movie also gets as many coins and kills as many enemies as possible without losing speed. Three glitches were used to save time. 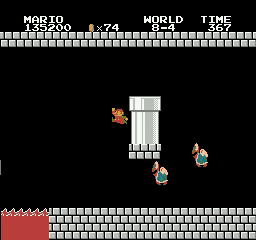 In addition to the wall jump and alternate pipe glitches in 8-4 that were also done in the previous version, the vine in 4-2 was used to do a teleportation glitch, followed by an alternate pipe glitch used to get to the warp zone faster. 8-4 was completed with 315 timeunits left (1 timeunit faster than the previous version). The delay involving fancy jumping at the end of 8-3 was to avoid the fireworks that come when the timer ends with a 3.